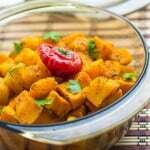 Caribbean pumpkin curry recipe – A delicious combination of pumpkin and sweet potato slow cooked in the oven in a creamy coconut sauce with pineapples. As the temperature is set to decline in the UK, right now couldn’t be more befitting to unleash this Caribbean pumpkin curry recipe. 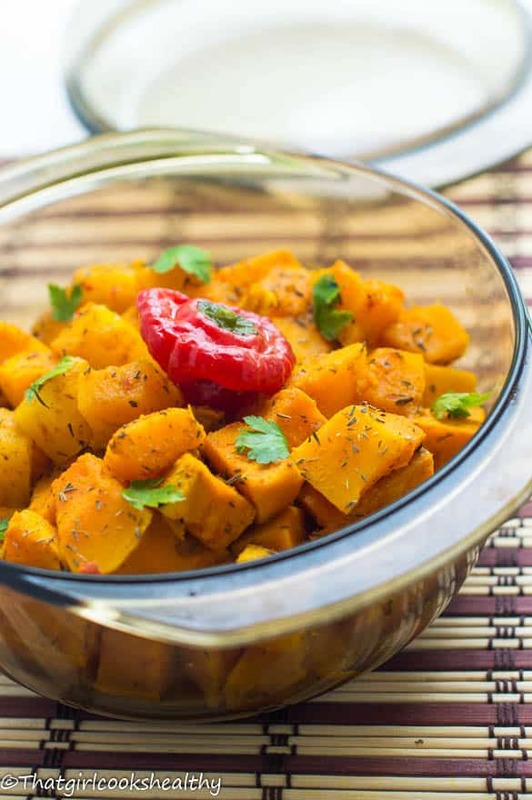 While it’s cold outside, with the temptation to hibernate until summertime (wishful thinking on my part) let me move your thought to this straight out of the oven, curried pumpkin dish – a true taste of the Caribbean, where sweet meets savoury coming to your very own kitchen. Honestly this is a simple one pot pumpkin curry recipe with Caribbean flavours and the taste will truly blow your mind. If you haven’t sample Caribbean food, then why not try this Caribbean dish. I still find it ironic that Caribbean cuisine is gravely misunderstood and it grieves me to hear some of the responses from others about what is Caribbean food? Contrary to popular belief, there’s more to the Caribbean than Roti, Jerk Chicken, Rice and Peas, Conch and Goat meat. We like to eat vegetarian food too and just like and other ethnic group, you’ll find a host of vegetarian and vegans. Although this curry is Asian Inspired, you cannot help to notice the true island vibe which become apparent with ther ingredients list – thyme, coconut milk, pineapple, scotch bonnet, lime, all spice just to name a few. Peel the sweet potato and pumpkin – This pretty much stands to reason, the exterior will need to be peeled prior to seasoning. Alternatively, you can obtain freeze pumpkin ans sweet potato you may use this instead to save time. 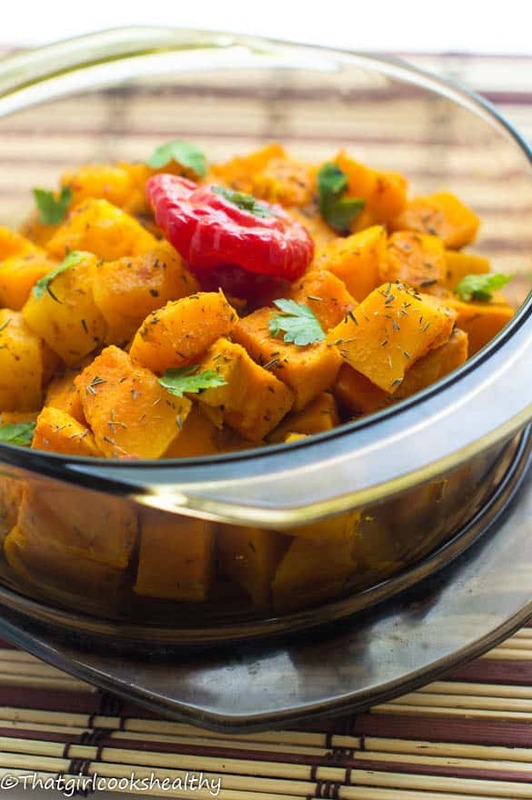 Marinate – For best results, leave the sweet potato and pumpkin to marinate in the curry paste (made from Caribbean curry powder) for at least an hour so the flavour really comes through. Cooking the vegetables in a pan – Before adding the pumpkin and sweet potato to the oven. They need to be cooked, seared and sealed to lock to flavour from the curry paste prior to moving to the oven. DON’T SKIP THIS STEP!! Use an ovenproof dish – use a casserole, pyrex or any suitable oven proof dish to accommodate the curry. Adding the coconut milk – pour the vegetables into the dish and then carefully pour in the coconut milk. This will lessen the chances of spillage or accidents. Slow cooking in the oven – allow the curry to cook in the oven for up to an hour, this is a slow cooker meal so leave the flavours to unleash into the oven. You gotta make this Caribbean pumpkin curry because………. Can I make this Caribbean pumpkin curry recipe on the stove top and/or crock pot instead? For stove top – Follow the instructions below stove skillet and simmer for 45 minutes. For Crock pot – Follow the instructions below transfer the content to a skillet and cook on high for 4 hours. 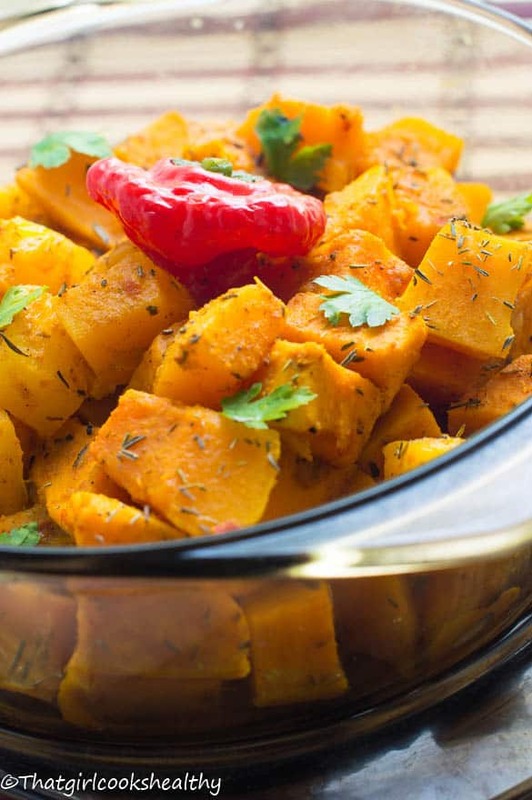 This recipe calls for Jamaican pumpkin aka calabaza but can use an alternative pumpkin. Add of the ingredients that are needed to make the curry paste and blitz until smooth in a blender or food processor. 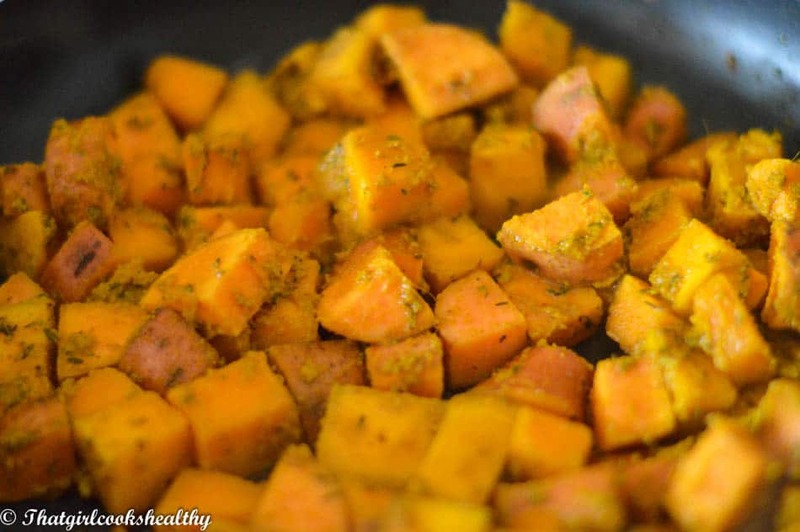 Add the sweet potato and pumpkin to a large bowl, then sprinkle and massage the thyme with the pink salt (about 1/4tsp worth) into the veggies. Add the coconut oil to a non stick frying pan on medium heat. Add the sweet potato and pumpkin after a minute, reduce the heat to low and cover the pan, stirring constantly and allow to sweat. for 10 minutes. Half way through add a sprinkle of black pepper, pineapple and cover again. Transfer the contents from the pan to an oven proof casserole dish with the bay leaves and coconut milk. Let the entire dish cook for 1 hour – feel free to braise the vegetables with the coconut milk half way through cooking time. You can use a pre blended Indian curry mix that you can buy from most grocery stores. Thanks for pointing that out I will post a link for a substitute. Did you ever a link for a substitution of the curry paste please. I would love to try this curry but am lost regarding the paste. Hi Linda. Are you in intolerant to the ingredients listed? You could try using just ground turmeric mixed with some water instead of making the curry. Just looking at the ingredients list I know am going to dig this. It has all my favorite ingredients right in the mix. Will definitely give this a try. Thanks for posting.